Have you ever seen a horse amble? With its head down and tail up, horses step strong and deliberately, showing off a majestic gait suited for royalty. That's exactly how the Missouri Fox Trotter earned its name. Missouri Fox Trotters are one breed of several so-called gaited horses. Not only are their movements smooth and beautiful, but they also have an incredibly solid and strong build. Those qualities combine to make an excellent and well-sought-after horse. Looking at its name, you won't have any difficulty to guess where the Missouri Fox Trotter breed came from. 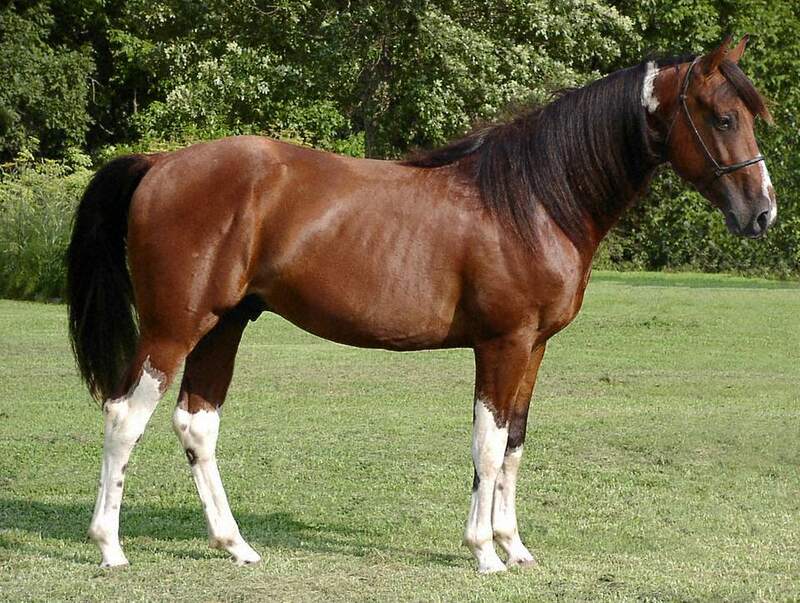 Settlers and pioneers developed the breed in the Ozark Mountains in Missouri in the early 19th century, combining other stock horse breeds with gaited horses. The horses quickly became revered by the locals thanks to their unique, smooth gait that made maneuvering the rocky terrain of the Ozarks seem effortless. This breed worked exceptionally well for families that needed a strong workhorse to plow fields, haul logs and work cattle and still look stylish when pulling their buggy to town. The Missouri Fox Trotter gave settlers and working families the best of both worlds. The Missouri Fox Trotting Horse Breed Association was founded in 1948 in Ava, Missouri and select horses were subsequently exported to Europe. Eventually, in 1992, the European Missouri Fox Trotting Horse Association was formed, bringing the breed worldwide attention. Rightfully so, the Missouri Fox Trotter became the state horse of Missouri in 2002. Missouri Fox Trotter horses have a straight face profile, a muscular body and a short back. You can sense their might at first glance, noting their sloped and powerful shoulders, sturdy legs and full chest. Their heads and tails are almost always held high and their ears pointed, giving them a regal look. Because they were bred from working stock horses, Missouri Fox Trotters are built for strength. With that, they are exceptionally surefooted and have a very unique gait that helps them handle difficult terrains while maintaining smooth conditions for their rider. When it comes to horse height, the Missouri Fox Trotter is fairly average. They typically stand at about 14 hands high, equivalent to about five feet, but can reach a height up to 16 hands, or five and a half feet. Built sturdy and strong, these horses weigh between 900 and 1,200 pounds, another relatively average measurement. It’s no surprise that their lifespan is average for horses, too. Missouri Fox Trotters typically live between 20 and 30 years but can survive longer with quality care. The Missouri Fox Trotter horse is the perfect horse for beginners, including children. People with disabilities often appreciate these horses as well. This is all thanks to their sure-footedness and poise. They hardly ever give a rider a bumpy ride. Their sure-footedness also lends well to trail riding and are often appreciated by trail riders, especially those who ride long distances who appreciate their stamina and weight-carrying abilities. These horses are ideal for horse packing trips. They’re exceptionally good-natured, friendly horses and love their people, so they’re always in demand as pleasure horses. Their gentle nature makes them great family pets. This breed has one of the most diversified sets of colors. Find them in chestnut, grey, champagne, palomino, black and more. Some individuals show white markings on their legs and face and others are spotted. The range of coat colors and patterns for the Missouri Fox Trotter is broad. The gait of the Missouri Fox Trotter, often called ambling or fox trotting, is unmistakable. Though they don’t step high, they step deliberately and with great care. Their foxtrot is at a speed somewhere between a walk and a gallop. It’s a four-beat broken diagonal gait in which the front foot of the diagonal pair lands before the hind, eliminating the moment of suspension. Because of the extra footfalls, the horse always has one foot on the ground, giving the rider a noticeably smoother ride. The Missouri Fox Trotter is known as a gaited horse breed. There are more than 30 gaited horse breeds able to perform a four-beat ambling gait. Missouri Fox Trotters are most popular for their easygoing, gentle dispositions as well as their strength and sure-footedness. They’re not typically sought after for show or racing. While there aren’t many specific celebrity Missouri Fox Trotters, individuals shine at home. However, a few family lines stand out among the rest and are known among Missouri Fox Trotter horse enthusiasts. These famous families recognized by horse breeders worldwide include Copper Bottoms, Diamonds, Brimmers, Red Bucks, Chiefs, Steel Dusts and Cold Decks. Is the Missouri Fox Trotter Horse Right for You? Beginner horseback riders will love the Missouri Fox Trotter. Their mellow attitudes and steady steps are ideal for riders who haven’t gotten their bearings yet. The Missouri Fox Trotter has also been known to work well for riders with disabilities as well as older adults. Because they’re so friendly, the Missouri Fox Trotter is often sought after as a family pet to hand down from rider to rider. They also do exceedingly well with trail riding in challenging terrain, making them a top choice for long-distance riders. Strength is a Missouri Fox Trotter’s greatest attribute. Thanks to this, they don’t have any common health problems and are not typically susceptible to a particular type of injury. Their basic upkeep requires daily doses of food and water, with vitamins and supplements as a bonus to get a nutritional boost. They also need plenty of regular exercise to maintain their muscles and overall health. Vaccines may prevent the Missouri Fox Trotter from contracting infections and illnesses like influenza and viral arthritis, so be sure to speak to your veterinarian to decide on the best way to keep your Missouri Fox Trotter healthy. Otherwise, explore all of our other horse breed profiles to find your perfect match.